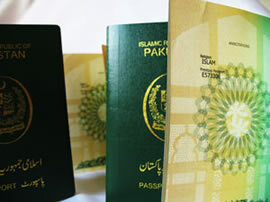 Manual passports In view of the ICAO deadline for non-acceptance of manual passports with effect from 30 September 2016, all Pakistanis living in Sweden and Finland are advised to get their manual passports replaced with the Machine Readable Passports (MRPs) as soon as possible to avoid any inconveniences such as financial losses, delays and cancelled trips during or before travel. It is further informed that this Mission has started issuance of MRPs since August 2015. The Passport Section of the Embassy’s website contains further details and requirements for issuance of MRPs. Machine Readable Passports (MRPs) are issued in conformity with International Civil Aviation Organization (ICAO) standards. Ever since the installation of Machine Readable Passport (MRP) facility at the Embassy of Pakistan in Stockholm, issuance of manual passports has been phased out. MRP office operates on the principal of live data capturing so applicants’ presence (with required documents) is compulsory to process the application. Applicants’ data entry, photo, Biometrics and signature are done by trained MRP officer using latest technology. Applicants DO NOT need to bring any application forms or photographs for MRP applications. Please click HERE to book your appointment and select your desired date and time. If you do not have VALID original CNIC or NICOP, please apply for one of these and proceed for Passport application after you have received it. Visit http://id.nadra.gov.pk for NADRA ID card online application. Married female/male applicants are required to produce original CNIC / NICOP / Smart National ID Card modified in accordance with their marital status before applying for MRP. Pakistan Government Officers/Employees are required to produce original No Objection Certificate (NOC) issued within last ninety (90) days by their respective Ministries / Divisions / Departments. 1st step towards Passport application of a newborn child is to apply for Birth Registration (S-1 registration) at Embassy of Pakistan in Stockholm. Facility for making payment by Credit/Debit Card is available at the Embassy. MRP Fee is not accepted in cash at the MRP section of the Embassy. • Applicant has to visit personally (0900 -1200 hrs) to collect the passport; however, family member (Parents, Spouse and Sibling) may also collect the passport upon proving identity. • Please bring your Original Token and Previous Passport at the time of collection. • Check status of your passport here before you visit to receive it. • Applicants who belong to Finland or other far-distant cities may provide registered envelope from Sweden Post Office with their written addresses. They are also required to provide their last passport and original token along with the envelope. This service is provided upon applicant’s personal request and Embassy does not take any responsibility if the passport is lost or delayed by the postal courier. • Police Report for the lost passport and valid Visa or Residency proof from the Immigration Department. • First Time Lost: Double fee will be charged. • Second Time Lost: Quadruple fee will be charged. • Third Time Lost: Case shall be referred to Director General of Immigration & Passports. If you would like to get an appointment for Passport or any consular related service, please click here.